William Odom, in his book The Collapse of the Soviet Military, repeats Alexander Yakovlev's description of Yazov as a "mediocre officer", "fit to command a division but nothing higher". Odom suggests Gorbachev was only looking for "careerists who would follow orders, any orders". Dmitry Yazov was a Soviet statesman and political leader, military commander. He was Marshal Union (1990), and Minister of Defense of the USSR (1987-1991). Last Defense Minister - a veteran of World War II. Yazon was a member of the Emergency Committee (18-21 August 1991). Yazov was born in the village parish Yazov Krestinskiy Kalachinsk district of Omsk province. His father - Timothy Y. Yazov died in 1933(4?). His mother - Mary Fedoseyevna Yazov - was also a peasant. The family had four children. Yazov volunteered for the Red Army in November 1941 when he was seventeen years old, failing to complete high school. When went to the army, he said that he was born in 1923. Yazov was enrolled to study at the Moscow Red Banner Infantry School behalf of the Supreme Soviet of the RSFSR (located in the evacuation Novosibirsk between 02 November 1941 and 28 January 1942) and graduated in June 1942. Certificate of graduation was only issied in 1953, when he was a major. 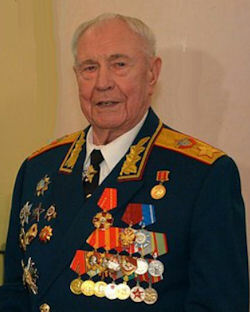 He served on the fronts of the Great Patriotic War from August 1942. He fought on the Volkhov and Leningrad fronts positions commander of Infantry Platoon and the commander of a rifle company, commander of the platoon frontline courses for junior lieutenants 483 Infantry Regiment, 177th Infantry Division of the Leningrad Front. He participated in the defense of Leningrad, in offensive operations of Soviet troops in the Baltic states, in the blockade Kurland grouping of German troops. In 1944 he joined the CPSU(b). He was twice wounded in action, after the first leg wound - back in operation, after the second, the head and face - was appointed platoon commander of front-line courses for exploits during World War II was awarded the Order of the Red Star in 1945. During the war, he graduated from the frontline as commanders refresher courses Volkhov Front. Immediately after the victory was sent to refresher infantry officers of the Red Army, where he graduated in 1946 and was appointed commander of a rifle company. Only in 1953 did he graduate from high school. In 1956 he graduated from the Military Academy named after Frunze with a gold medal and was appointed commander of a motorized infantry battalion. Since October 1958 goda - a senior officer in the Office of combat training of the Leningrad Military District. Since October 1961 he was commander of a motorized infantry regiment of the 63rd Guards Rifle Division, promoted to Colonel 20 June 1962. The post of commander of the regiment was assigned on the personal orders of Marshal Chuikov. During the Cuban missile crisis 400th Motorized Rifle Regiment under Yazov was secretly deployed to Cuba and stayed there from September 1962 to October 1963 in readiness to repel invasion of the United States to the island. Since September 1963 he was deputy and then head of the department of planning and military training of staff of the Leningrad military district (until 1965). In 1967 he graduated from the Military Academy of the General Staff. Since October 1967 he was the commander of a motorized infantry division, and promoted to Major General (02/22/1968). Since March 1971 he was the commander of the Army Corps, being promoted to Lieutenant-General 15 December 1972. Since January 1973 he was the commander of the 4th Army, and since May 1974, Head of the Main Personnel Directorate of the Ministry of Defence of the USSR. Since October 1976, he was first deputy commander of the Far Eastern Military District, having been promoted to Colonel-General 28 October 1977. Since January 1979 he was the commander of the troops of the Central Army Group on the territory of Czechoslovakia. Since November 1980 he was Commander of the Central Asian Military District, and promoted to General of the Army 02 June 1984. Since June 1984 he was Commander of the Far Eastern Military District, according to some media reports, during his service in the Far East he became friends with Kim Il Sung. Since January 1987 he was Deputy Minister of Defense of the USSR Human Resources. He was in this post was only four months. Unexpectedly, Yazov was appointed Minister of Defence of the USSR Presidium of the Supreme Soviet of the USSR on 30 May 1987 - after the flight Matthias Rust and the subsequent resignation of Marshal S.L.Sokolova. The first three years as Minister Yazov remained General of the Army, which was unusual (from 1935 all the heads of the military establishment were Marshals, except Stalin, who in 1941 became the People's Commissar of Defence until 1943 had no title). On 28 April 1990 Soviet President Mikhail Gorbachev awarded DT Yazov the title of Marshal of the Soviet Union. This was the last assignment of such title in the history of the Soviet Union. Yazov was also the only Marshal of the Soviet Union born in Siberia. D.T.Yazov became defense minister in a difficult time for the country and the army, when Mikhail Gorbachev had taken the political decision to reduce nuclear weapons. He, like most of the senior military leadership of the country, did not agree with the fact that the reduction should be carried out at a pace and in a wide range. Also he had to carry out the decision on the reduction of the army to prepare a conclusion groups of Soviet troops from the territory of foreign countries. After the party conference in June 1988, Yazov and Akhromeyev — apparently under increasing pressure from Gorbachev — had grudgingly begun defining parity more in qualitatiVe than quantitative terms. Before that time, they both had repeatedly stated that the level of Soviet forces was determined by the level of Western forces and had spoken forcefully against making any unilateral cuts. In an article appearing the day before Gorbachev's unilateral troop cut announcement, Akhromeyev reiterated his concerns. Only four members of the senior leadership - Gorbachev, KGB chairman Vladimir Kryuchkov, Defense Minister Dmitry Yazov, and Lev Zaikov (the Politburo member responsible for military industries) - were fully aware of the secret biologial weapons program. Some Soviet officials openly showed their distaste for current journalistic conduct at home. 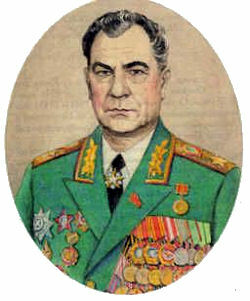 Defense Minister Dmitri Yazov, in a January 1988 television appearance, sharply criticized the press for undermining public respect for the Red Army and called on it to instill patriotism in Soviet youth. On 1 September 1983, a Soviet Su-15 interceptor fired two air-to-air missiles at a Korean Airlines Boeing 747 airliner, Flight 007, destroying the aircraft and killing all 269 crewmembers and passengers. In 1988 Defense Minister Gen. Dmitri Yazov asked visiting Secretary of Defense Frank Carlucci: "Tell me, why did you Americans use that Korean airliner as a spy plane?" Carlucci could not convince the Soviet general that his suspicions were unfounded. In March 1991, in connection with the reorganization of the Soviet government (the creation of the Cabinet of the President of the USSR) he was reassigned to the post of Minister of Defense of the USSR by Decree of the President of the USSR. Defense Minister Dmitri Yazov concluded the Gulf war and the CFE Treaty taken together signified a basic shift in the "correlation of forces" between the NATO and the USSR in the West's favor -- a dangerous situation if Gorbachev's revised threat assessment of Western intentions was wrong (something of which Yazov was firmly convinced. The "new world order" Washington was talking about was really "American command in the world arena," in the diehards' eyes. Member of the CPSU since 1944, candidate member of the Central Committee of the CPSU in February 1981, a member of the CPSU Central Committee from June 1987 to August 1991, a candidate member of the Politburo of the CPSU Central Committee from June 1987 to July 1990. A member of the Presidential Council of the USSR in March - December 1990. A member of the Security Council of the USSR in December 1990 - September 1991. Deputy of the Supreme Soviet of the USSR 10-11 convocations (1979-89). The "power ministers," Dmitri Yazov (defense), Boris Pugo (interior), and Vladimir Kryuchkov (KGB) as well as Gennadi Yanaev, his vice president, were the real threat to Gorbachev, as became clear when they emerged as the ringleaders of the August 1991 coup. Gorbachev was not able to attack them openly not only because the ministers were his appointees but also because they were "his last remaining power base." Avoiding a political shakeup on the eve of the G-7 summit in Paris, where Gorbachev hoped to obtain Western economic aid, was another consideration. In Moscow, Gorbachev had been their political hostage, but at Foros in August 1991 he became a real hostage. The coup plotters hoped to prevent the break-up of the Soviet empire by putting an end to the Novo-Ogarevo agreements for a new Union of Soviet Sovereign Republics, Gorbachev's last-ditch effort to keep the Soviet state intact as a confederation. (They also knew that Gorbachev was planning to replace them and hoped to keep their positions. Conservative Yazov was unpopular in the circles of supporters of perestroika; in 1991 he joined the upcoming putsch and from the first day went into its composition; in Moscow on his orders she was introduced tanks and heavy military vehicles. Gennady Yanayev, the pasty-faced bureaucrat whom Gorbachev had appointed vice president earlier that year, was the acting president. He was joined by Defense Minister Marshal Dmitri Yazov, a beefy general whom Gorbachev had plucked from the ranks to shake up the armed forces in 1987, and KGB chairman Vladimir Kryuchkov, who had recommended the closure of the Soviet biological warfare program. Yazov went to Foros to see Gorbachev, and immediately on his return was arrested at Vnukovo airport on the night of 22 August 1991. The arrest of Yazov was personally attended by Minister of Internal Affairs of the Russian Federation Viktor Barannikoff and the Attorney General of the RSFSR Valentin Stepankov. The investigation was formally conducted under article 64 - treason. On the day of his arrest the Decree of the President of the Soviet Union on the release of his duties as Minister Yazov Soviet Defense was issued, which was submitted to the session of the Supreme Soviet of the USSR. Also on this day in a rest home "Senezh" Administrative Department of the Council of Ministers of the RSFSR (on a lake Senezh), the first interrogation of Yazov began. Hhe called the actions of the State Emergency Committee "stupidity", which should not be repeated. This interrogation was conducted without a lawyer. After this interrogation Yazov, along with another member of the Emergency Committee, Tizyakovym, were taken to the detention center of Cascina (Kalinin region). On August 25 Yazov was transferred to Matrosskaya Tishina. After his arrest, Yazov, his wife was evicted from the apartment on the Kosygin street, and passbook savings were seized. She lived with relatives. Emma Evgenievna was denied medical care hospital doctors, for which she was assigned. She did not have money for expensive medicines, and had to sell fur coats, furniture, and jewelry. On the morning of August 22 prior to the first interrogation, Yazov sent Gorbachev with a recorded video message in which he read the letter and called himself "an old fool," he regretted participating in this "adventure" and asked for forgiveness from the President of the USSR. Two decades after these events Yazov said he did not remember what he said. In his memoirs, Yazov said that he was persuaded to apply the penitential speech to Gorbachev, and under the influence of fatigue, he succumbed to the entreaties of television reporters. On August 29, 1991 the Supreme Soviet President Gorbachev adopted the position endorsing the exemption from the post of Yazov. According to paragraph 3 of Article 113 and paragraph 6 of Article 3 of the Constitution of the USSR 127 members of the Federal Government are appointed and dismissed by the President with the consent of the USSR Supreme Council. On December 19, 1991 was found guilty in absentia of art. 88 h. 2 of the Criminal Code of the Lithuanian SSR (attempt to commit coup d'etat), of involvement in the events in Vilnius in January 1991. The article provides for the conclusion of 15 years or the execution. On January 26, 1993 the former defense minister was released from detention, together with other members of the Emergency Committee Yanayev, Pavlov, Kryuchkov, Baklanov and Tizyakovym. On February 23, 1994 he was granted amnesty by the State Duma of the Federal Assembly of the Russian Federation. Prior to this, on 7 February 1994, he was dismissed from military service; later he went on to participate in the veterans' activities and was present among the guests of honor at the Victory Parade. After his resignation for some time served as chief military adviser to the Main Department of International Military Cooperation, Ministry of Defense of Russia, the chief adviser to the consulting Chief of the General Staff Academy. After reconstitution in 2008, he worked with the Inspectors General Service the Defense Ministry of Russia - a leading analyst (Inspector General) Office of Inspector General of the Ministry of Defense of the Russian Federation. From 2000 to 2010 he headed the Committee Memory of Marshal Zhukov, and remained an active member of the presidium of the Committee. He was a member of the governing bodies of a number of public organizations (including the Forum "Social recognition" and Chief Consultant of the Military Memorial Center of the Russian Armed Forces.